The idea was hatched. The talk was talked. And the plane tickets have just been purchased. The Hauze Bros. are going abroad. In two weeks, we leave for Eurasia. Our trip will have us circling Spain and Morocco from Madrid to Sevilla to Tangier and back. Do we know what we're doing? Hell no. Any ideas on how to get around? None. Will it be an adventure? Most definitely. Hi Brett. Interesting article. I visited Morocco in last year and spent there for a week. I visited Casablanca, Marrakesh, Fez and Tangiers. Most of all I liked Tangier, also known as the White City, revolves around its brilliant import and export port, and assures you to see many millionaires' yachts where the Mediterranean and Atlantic Ocean meets. I think it is a good idea invest in Tangiers property, and enjoy by soft climate and nice looking nature. 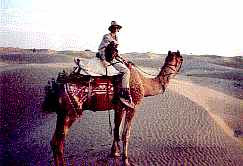 And the best adventure which I had in Morocco was a trip to the Sahara desert.